The Best Economics blogs from thousands of top Economics blogs in our index using search and social metrics. Data will be refreshed once a week. Also check out Top Economics Youtube Channels list for Top videos on Economics. Economics newsletter is a comprehensive summary of the day's most important blog posts and news articles from the best Economics websites on the web, and delivered to your email inbox each morning. To subscribe, simply provide us with your email address. New York and the World About Blog Get latest Articles on Economics from the Bloomberg. Bloomberg delivers business and markets news, data, analysis, and video to the world, featuring stories from Businessweek and Bloomberg News. Facebook fans 2,257,709. Twitter followers 21,042. About Blog An economist and a journalist join forces to make the often daunting topic of economics easily understood and digested by general audiences. It’s a fun and informative exploration of how the subject’s basic principles drive the minutiae of day-to-day existence. Facebook fans 376,052. Twitter followers 634,178. San Francisco, CA About Blog News and discussion about economics, from the perspective of economists. Facebook fans 1,211,659. Twitter followers 579,052. New York, NY About Blog Real Time Economics offers exclusive news, analysis and commentary on the U.S. and global economy, central bank policy and economics. Economic insight and analysis from The Wall Street Journal. Facebook fans 5,265,314. Twitter followers 770,598. London About Blog The Financial Times is one of the world’s leading business news and information organisations, recognised for our authority, integrity and accuracy. Here you will find news on global economics. Facebook fans 3,275,308. Twitter followers 2,585,961. Washington, DC About Blog Reflections on economics, finance, and policy by the former Chairman of the Federal Reserve, now Brookings Distinguished Fellow in Residence. The Brookings Institution is a nonprofit public policy organization based in Washington, DC. Our mission is to conduct in-depth research that leads to new ideas for solving problems facing society at the local, national and global level. Facebook fans 310,476. Twitter followers 254,966. New York, NY About Blog FiveThirtyEight, created by Nate Silver, who is best known for election forecasts such as the 2012 presidential election in which FiveThirtyEight correctly predicted the vote winner of all 50 states. The site regularly publishes articles by creating or analyzing statistical information on a wide variety of topics in current politics and economic news. Facebook fans 347,619. Twitter followers 801,843. About Blog Marginal Revolutions is currently one of the most popular economics blogs. It is written by Tyler Cowen and Alex Tabarrok, both of whom are professors at George Mason University. In addition to a daily roundup of interesting links, the blog features some of the best economics debates on the web. Facebook fans 8,816. Twitter followers 33,619. Auburn, Alabama About Blog The Mises Wire is a blog publication by the Mises Instituion which promotes teaching and research in the Austrian school of economics. The posts apply Austrian economic theory on current or historical events. Facebook fans 203,582. Twitter followers 73,634. Indianapolis, IN About Blog The Library of Economics and Liberty is dedicated to advancing the study of economics, markets, and liberty. It offers a unique combination of resources for students, teachers, researchers, and aficionados of economic thought. Facebook fans 76,462. Twitter followers 13,557. Federal Reserve Bank of NY About Blog The New York Fed's Liberty Street Economics blog provides commentary on current economic topics relating to monetary policy, macroeconomic developments, financial stability issues, and regional trends in the Second Federal Reserve District. Facebook fans 21,859. Twitter followers 11,783. Washington DC About Blog The Economic Policy Institute (EPI) is a nonprofit, nonpartisan think tank created in 1986 to include the needs of low- and middle-income workers in economic policy discussions. EPI believes every working person deserves a good job with fair pay, affordable health care, and retirement security. To achieve this goal, EPI conducts research and analysis on the economic status of working America. Facebook fans 104,232. Twitter followers 35,506. Yonkers, NY About Blog Because spending trends do hold sway over how economies operate, it makes sense for fans of the subject to pay attention to what the consumers themselves have to say. Issues like recalls and rip-offs that change how businesses conduct themselves need to be taken into consideration before investing and predicting future outcomes. Facebook fans 40,838. Twitter followers 53,422. London, United Kingdom About Blog VOX is an awesome blog created by the The Centre for Economic Policy Research, which promotes research excellence and policy relevance in European economics. It covers a diverse range of research based analyses on policy and economic issues. The content can appeal to a diverse audience of economic students to professional economists. Facebook fans n/a. Twitter followers 27,479. Washington DC About Blog The mission of the Economics and Statistics Administration is to provide high-quality economic analysis and foster the missions of the Census Bureau and the Bureau of Economic Analysis. Facebook fans 1,053. Twitter followers 3,576. About Blog Armstrong Economics is an economic forecasting organization based on the cyclical models developed by Martin Armstrong. Our mission is to remove opinion from forecasting through the use of our advanced technical models while educating the public on the underlying trends within the economy. Facebook fans n/a. Twitter followers 8,519. Crystal Lake, IL About Blog This highly praised global economics blog is written by Mike “Mish” Shedlock, an investment advisor. Mike provides profound comments on macroeconomic trends around the world, which makes this a must read blog. Facebook fans n/a. Twitter followers 13,251. NYC About Blog The Big Picture, an excellent blog that looks at macroeconomic issues, is written by Barry L. Ritholtz. Barry is the founder of Ritholtz Wealth Management. The Big Picture breaks down and explains the latest economic news in great detail. Facebook fans 2,628. Twitter followers 97,085. New York, NY About Blog Yves Smith is the pseudonymous author of Naked Capitalism, a popular blog about the U.S. economy and the financial sector. Naked Capitalism was started to combat the underreporting of Wall St. and the economy by mainstream media. They don’t hold back any punches against government officials or corporate interests. Facebook fans 10. Twitter followers 20,799. Berkeley, California About Blog We created this interactive site to give voice to our scholars’ ideas and opinions in a forum that encourages public comment. This blog serves as a virtual blackboard for ideas and expertise found on the Berkeley campus.Here you will find latest updates on economics. Facebook fans 470,419. Twitter followers 153,662. About Blog Calculated Risk is a well known financial blog maintained by Bill McBride since January of 2005. While its coverage of individual stocks is limited, the financial blog is widely followed for its economic commentary. Traders often use the stories to formulate opinions about macroeconomic events—such as housing data or employment statistics—and how they will affect major indices. Facebook fans 1. Twitter followers 41,955. Eugene, OR About Blog Mark Thoma, a Professor of Economics at the University of Oregon, writes about macroeconomics on the Economist’s View. He posts a daily round up of interesting blogs links, while sometimes writing his own detailed analysis in longer posts. Facebook fans n/a. Twitter followers 722. Berkeley, CA About Blog Robert Reich is the former secretary of labor for the Clinton administration. He’s currently Chancellor’s Professor of Public Policy at the U.C. at Berkeley. His blogging style is thought-provoking, direct and understandable. Facebook fans 1,659,605. Twitter followers 320,822. New York, NY, USA About Blog Chris Blattman is an Associate Professor at Columbia University. Through his blog, Chris explores statistics and cultural trends to examine poverty and political participation. His weekly links capture some of the best content on the web. Facebook fans 4,920. Twitter followers 64,507. About Blog MishTalk is Mike's global economics blog where he typically writes several articles a day topics such as interest rates and central bank policy, gold and precious metals, jobs and economic reports, all from an Austrian Economic perspective. Washington, D.C. About Blog The Center for Economic and Policy Research (CEPR) promotes democratic debate on the most important economic and social issues that affect people's lives. CEPR is committed to presenting issues in an accurate and understandable manner, so that the public is better prepared to choose among the various policy options. This blog is great for people looking to stay informed about the American economy. Facebook fans 59,012. Twitter followers 23,529. George Mason University About Blog Cafe Hayek is a very popular economics blog by Professor Don Boudreaux (George Mason University) and Russ Roberts (Research Fellow at Stanford University). They argue against a Keynesian view of economics in today’s issues and governmental systems. Facebook fans 5,760. Twitter followers 7,858. UK About Blog Our view on economic forecasts, to regulation to behavioural economics, with consideration to what businesses should be thinking about. Facebook fans 8,236. Twitter followers 69,676. About Blog With the strength of over half a dozen regular contributors, who are professors and researchers, The Incidental Economist is one of the most formidable health economics blogs. They blog about the U.S. health care system, how it works and how it could be improved. Facebook fans 2,253. Twitter followers 8,000. About Blog EconBrowser is a blog that provides an analysis of current economic data, issues and macroeconomic policy. It is written by Professor James Hamilton (University of California, San Diego) and Professor Menzie Chinn (University of Wisconsin, Madison). Washington, D.C. About Blog Equitable Growth is an organization founded to accelerate cutting-edge analysis into whether and how economic inequality affects growth. Facebook fans 1,249. Twitter followers 8,818. About Blog The author Greg Mankiw, a Professor of Economics at Harvard University, has created some unique content like a principles of economics rap and animated video. His advice for student is extremely relevant for anyone studying economics. Facebook fans 428. Twitter followers 14,832. About Blog The Money Illusion is a highly regarded economics blog by Scott Sumner, who teaches at Bentley University. Through his blog, he popularized the idea of targeting the Nominal GDP, an idea which was later endorsed by the Federal Reserve. Facebook fans n/a. Twitter followers 2,950. Oxford About Blog Tim is an economist, journalist and broadcaster. He is author of “Messy” and the million-selling “The Undercover Economist”, a senior columnist at the Financial Times, and the presenter of Radio 4’s “More or Less”. Tim has spoken at TED, PopTech and the Sydney Opera House and is a visiting fellow of Nuffield College, Oxford. Facebook fans 17,242. Twitter followers 120,694. Berkeley, California About Blog J. Bradford DeLong was one of the first economics bloggers and his continues to reflect that with a large number of links. DeLong is a Professor of Economics at U.C. Berkeley. His well thought out insights on macroeconomic issues makes this a must-read blog. Facebook fans n/a. Twitter followers 70,319. Badger About Blog We offer policy advice and economic analysis from a group of professional economists, legal scholars, and financial market practitioners. Dedicated to modern money theory (MMT) and policies to promote financial stability and the attainment of full employment. Facebook fans 3,431. Twitter followers 2,368. Palo Alto, CA About Blog John Cochrane, Senior Fellow of the Hoover Institution at Stanford, is The Grumpy Economist. But he claims to not actually be grumpy. On this blog, he provides detailed commentary backed with data and exceptional reasoning on current economic news, finance and policy policy. Facebook fans n/a. Twitter followers 11,260. Oakham About Blog Stumbling and Mumbling is a personal blog of Chris Dillow, an economist who spent eight years with one of Japan’s largest banks. He blogs about British politics and provides thoughtful analyses on the British economy and sports. Facebook fans n/a. Twitter followers 7,351. About Blog Posts are by authors of papers published in the RWER. Facebook fans n/a. Twitter followers 12,897. Newcastle, Australia About Blog Bill Mitchell is a Professor of Economics and Director of the Centre of Full Employment and Equity (CofFEE), at the University of Newcastle, NSW, Australia. His blog is about Modern Monetary Theory with importance to macroeconomic reality. Facebook fans n/a. Twitter followers 7,983. Boone, NC About Blog The two authors, Tim Haab and John Whitehead are both Economics Professors. Environmental Economics is a blog intended for a wide audience and approaches its arguments with an easy to understand writing style. Facebook fans 1,711. Twitter followers 634. About Blog The Baseline Scenario is a blog discussing economics and economic policy written by Simon Johnson and James Kwak.The Baseline Scenario is dedicated to explaining some of the key issues in the global economy and developing concrete policy proposals. Facebook fans 6,875. Twitter followers 20,066. Bengaluru, India About Blog Mostly Economics is an India focussed economics research blog run by Amol Agrawal. He covers a wide range of economic topics while frequently updating his audience on the Indian economy. Facebook fans n/a. Twitter followers 526. Washington, D.C. About Blog A blog devoted to exploring and promoting ideas for an alternative monetary future. Our goal is to reveal the shortcomings of today’s centralized, bureaucratic, and discretionary monetary arrangements, and to bring serious consideration of real alternatives to the center stage of current monetary and financial reform debates. Facebook fans 3,332. Twitter followers 2,321. About Blog The Angry Bear blog is a very popular multi-author blog. This left-leaning blog provides incisive commentary on U.S./Economics, law and politics. Facebook fans 235. Twitter followers 2,152. Cambridge, MA About Blog Dani Rodrik’s weblog is authored by economist and Professor Dani Rodrik (Harvard Kennedy School). His blog looks thoroughly at the underlying issues of global development. Facebook fans n/a. Twitter followers 71,915. Ottawa, Canada About Blog The Worthwhile Canadian Initiative blog is a self proclaimed “mainly Canadian economics blog”. Written by a group of intelligent economists, this blog is filled with top quality posts ranging from health, finance and inequality. Facebook fans n/a. Twitter followers 2,548. Naperville, IL About Blog Blog by Jeff Miller. Investment manager, blogger on economy and finance, here you will find an ecletic approach to better trading and investment. This approach is coupled with an instinctive and detailed analysis of market and economic trends. Facebook fans n/a. Twitter followers 3,789. Los Angeles, CA About Blog Jason’s research interests include all issues related to healthcare policy and economics, value-based purchasing, the health insurance market, and Medicare policy research. Facebook fans n/a. Twitter followers 157. Washington, DC About Blog Jared Bernstein's areas of expertise include federal and state economic and fiscal policies, income inequality and mobility, trends in employment and earnings, international comparisons, and the analysis of financial and housing markets. Facebook fans n/a. Twitter followers 41,974. About Blog Credit Writedowns is a news and opinion site dedicated to bringing a well-informed view of finance, economics, markets, and foreign policy into the mainstream consciousness. Edward Harrison is the founder of the finance news and forecasting site Credit Writedowns. Facebook fans 1,064. Twitter followers 21,708. Minnesota About Blog Conversable Economist is an economics blog by Timothy Taylor, who is the author of several economics books. Timothy goes deep into details about a range of topics, backing his arguments up with statistics and data. He has also written Journal of Economic Perspectives. Facebook fans n/a. Twitter followers 2,417. U.S. About Blog The Economic Populist is an economic opinion and analysis site. We give voice to the little guy and are heavily focused on statistics, sources and graphs. Economic Populist is an Economics, Business, Finance and Labor blog focused on the United States and Middle Class. Facebook fans 553. Twitter followers 545. Ann Arbor About Blog Confessions of a Supply-Side Liberal was created by Miles Kimball, a Professor at the University of Michigan. His core topics apply supply side solutions to macroeconomic issues and monetary policy. His arguments are well written and thoroughly researched. Facebook fans n/a. Twitter followers 16,728. NYC About Blog An economics, investment, trading and policy blog with a focus on Modern Monetary Theory (MMT). We seek the truth, avoid the mainstream and are virulently anti-neoliberalism. Facebook fans 294. Twitter followers 2,072. Atlanta, Georgia About Blog he Atlanta Fed's macroblog provides commentary on economic topics including monetary policy, macroeconomic developments, financial issues and Southeast regional trends. Facebook fans 2,866. Twitter followers 49,031. London About Blog John Kay is one of Britain’s leading economists. His interests focus on the relationships between economics and business. Today his main focus is on writing and he is renowned for his ability to express complex ideas clearly and succinctly. He is a journalist for the Financial Times, a successful author, an academic and a businessman. Facebook fans 57. Twitter followers 12,065. About Blog Blog by two professors at Northwestern University, Jeff Ely and Sandeep Baliga, this blog mostly discusses economic and political issues and other interests of the writers. Facebook fans n/a. Twitter followers 1,183. University of Queensland About Blog John Quiggin’s blog focuses on Australian economics and politics. He delivers an interesting perspective on current events in Australia. He also hosts a weekly ‘sandpit’ forum style discussion. Facebook fans 1,147. Twitter followers 8,347. About Blog Azizonomics, by John Aziz, discusses economics at the intersection of technology and futurism, which results in some very thoughtful and absorbing posts like the economics of building the US-Mexico wall. Facebook fans 522. Twitter followers 8,772. Washington DC About Blog David Glanser is an economist in the Washington DC area. My research and writing has been mostly on monetary economics and policy and the history of economics. Uneasy Money is a blog about monetary policy, which means it is also about monetary theory and macroeconomics. Facebook fans n/a. Twitter followers 1,340. Stanford, CA About Blog Hi, I'm Keith Hennessey. I work as a Lecturer at Stanford University's Graduate School of Business, teaching American economic policy to MBA students. This blog is aimed at students of American economic policy. Facebook fans 2,102. Twitter followers 5,529. Facebook fans n/a. Twitter followers 948. Victoria, BC, Canada About Blog This informative blog by Dave Giles, a Professor of Economics at the University of Victoria.This blog has a strong econometrics focus. Facebook fans n/a. Twitter followers 1,820. About Blog A Web-based independent commentary on the production and distribution of economic ideas. A weekly column about economics and politics, formerly of The Boston Globe, independent since 2002. London About Blog Long and Variable is a blog on macroeconomics and public policy. Authored by Professor Tony Yates (University of Birmingham), this blog is quite detailed and knowledgeable about global monetary policy. Facebook fans n/a. Twitter followers 9,866. London About Blog Diane Coyle is a professor of economics at the University of Manchester and runs the consultancy Enlightenment Economics. We has long-standing specialist expertise in technology markets, innovation and competition policy. We are currently working on projects on the implications of the spread of mobile broadband for inequality in low-income economies. Facebook fans n/a. Twitter followers 13,394. London About Blog Policy Research in Macroeconomics (PRIME) is a network of macroeconomists, political economists and professionals from related disciplines who seek to engage with a diverse audience in order to de-mystify economic theories, policies and ideas. Our aim is to develop and frame macroeconomic theories, applications and solutions to the severe economic, social and ecological problems of the world. Facebook fans n/a. Twitter followers 6,701. About Blog Professor John Taylor (Stanford University) blogs at Economics One, a blog suited fr more experienced economists. Here, he analyzes and gives astute commentary on mostly current macroeconomic issues. Facebook fans n/a. Twitter followers 9,913. London, England About Blog The Microeconomic Insights blog posts summaries of high quality microeconomic research to inform its audience about global microeconomic issues. Its topics cover all areas of microeconomics, including development, health economics, environmental economics and international trade. Facebook fans n/a. Twitter followers 956. About Blog Commentary on Economics, Information and Human Action. Knowledge Problem was created by Professors Lynne Kiesling (Northwestern University) and Michael Giberson (Texas Tech University). They explore topics and breakdown current news related to anti-trust and energy economics. Facebook fans 534. Twitter followers 1,828. About Blog Truth on the Market offers commentary on law, business, economics and more. We hope you find some of our posts insightful, thought-provoking, or at least mildly interesting. This blog was formed by a group of law professors and economists. Facebook fans n/a. Twitter followers 220. Australia About Blog A blog by Jason Collins on economics, evolution and those areas in between. Posts mainly focussed on topics such as Economics, Behavioural and Data science. Facebook fans 1,303. Twitter followers 2,669. London, England About Blog Blog by Shaun Richards. I am an independent economist who studied at the London School of Economics. My speciality is monetary economics and I analyse current economic trends. Facebook fans n/a. Twitter followers 6,218. Australia About Blog Blog by Dr. Jonathon Deans. I study energy and commodity markets for an Australian research institute, and have a doctorate in economics as well as masters degrees in business administration and finance. As a hobby, I study the economics of the fountain pen world and communicate my findings here. Facebook fans n/a. Twitter followers 943. Denver, CO About Blog The truth behind Wall Street, what's coming next, and how to thrive while we watch the dollar die! Facebook fans n/a. Twitter followers 332. United Kingdom About Blog The Academic Health Economists’ Blog exists to provide an on-line presence for the discussion of issues and developments in health economics. A place where people can present their views, opinions, ideas, and takes on current affairs from the perspective of health economics. The site has a simple aim; to promote healthy debate in the field, with a sharing of ideas. Facebook fans 249. Twitter followers 3,745. Cambridge, Massachusetts, USA About Blog An Economic View of The Environment is a blog by Robert Stavins, who is a professor at Harvard University and is the Director of the Harvard Environmental Economics Program. His posts paint a comprehensive view of global environmental issues from an economic standpoint. Facebook fans n/a. Twitter followers 2,773. London UK and Los Angeles USA. About Blog Roger Farmer is Research Director at NIESR, London, and Professor of Economics at the University of Warwick in the UK. He is also a Distinguished Professor of Economics at UCLA and considers his views as a “blend of Keynesian and classical ideas.” The topics in his blog cover macroeconomic issues such as Federal Reserve policy. Facebook fans n/a. Twitter followers 8,697. Nashville, TN About Blog Blog by David Beckworth, an associate Professor of Economics at Western Kentucky University, has recently launched an awesome podcast that features well-known economists, many of whom are featured on this list. David’s blog highlights is a great place to start to learn about specific economic events. Facebook fans n/a. Twitter followers 3,998. Wellington, New Zealand About Blog This New Zealand based economics blog was created by two economists, Eric Crampton and Seamus Hogan. They explore a range of fascinating topics from sports economics to housing and much more. Sharp and easy to follow analysis. Facebook fans n/a. Twitter followers 2,712. About Blog This blog began in 2006 and was solely authored by Joshua Gans, an economics professor at the University of Melbourne. In 2008, the blog became multi-authored with other academic economists joining Core Economics. The topics on this blog reflect the wide interests of the authors. Much of the commentary is about economic policy and economic issues. London About Blog EconomicsUK is the personal website of David Smith, the Economics Editor of The Sunday Times, London. His easy to understand writing and clearly defined causes and consequences makes this an accessible blog for beginners. Facebook fans n/a. Twitter followers 33,470. About Blog Multiplier Effect is the blog of The Levy Economics Institute of Bard College, an economics research organization. The posts focus on economic policy in the United States and the rest of the world, prompting a reasoned discussion on current issues. Facebook fans 2,515. Twitter followers n/a. The wide world of sports! About Blog The Sports Economist is produced by a group of scholars who apply economic thinking to sports. TSE provides commentary and links to issues in the news, along with an occasional essay. Facebook fans n/a. Twitter followers 2,234. About Blog The Everyday Economist is a blog written by Josh Hendrickson, an Assistant Professor of Economics at the University of Mississippi. Josh’s flair for simple and readable writing on current economics issues makes this one of the best economics blogs for beginners. About Blog No Hesitations contains news and views, comments and criticisms, rants and raves, focusing mostly, but not exclusively, on dynamic predictive modeling in economics and finance. Facebook fans n/a. Twitter followers 1,680. Brooklyn About Blog Josh Mason, an Assistant Professor of Economics at City University of New York, blogs at The Slack Wire. This economics blog primarily revolves around macroeconomics issues and economic history, which Josh captures extremely well. He does an excellent job of analyzing economic news. Facebook fans n/a. Twitter followers 1,949. Ontario About Blog Economics and the mid-life crisis have much in common: Both dwell on foregone opportunities. Facebook fans 1. Twitter followers 171. Singapore About Blog Antonio Fatas is a Professor of Economics at INSEAD, an international business school with campuses in Singapore, France and Abu Dhabi. Antonio highlights important economic data coming out central banks and analyzes the implications for us in a way that is readable by economists and non-economists. Facebook fans n/a. Twitter followers 2,419. About Blog Stochastic Trend by David Stern, is an Energy and Environmental Economist at the Australian National University. This energy and environmental economics focussed blog uses econometrics and modeling to base its arguments, which makes it a reliable resource but requires background knowledge to understand. Grand Forks, ND About Blog Barter is Evil is an economics blog where the author, Professor David Flynn (University of North Dakota) encourages the exchange of ideas on economics, economic history and statistics. His blog places an emphasis on the North Dakota economy, which provides us with great insight on the impact of the oil industry boom there. Facebook fans n/a. Twitter followers 484. About Blog A blog exploring the intersection of economic thinking and urban planning/real estate development and related big-think themes.Gordon's research interests are in applied urban economics. About Blog Mainly Macro is a near daily commentary by Professor Simon Wren-Lewis (Oxford University) on global macroeconomic issues. His excellent writing style and explanation appeals to economists and non-economists. Facebook fans n/a. Twitter followers 25,775. About Blog True Economics is about original economic ideas and analysis concerning everyday events, news, policy views and their impact on the markets and you. Facebook fans n/a. Twitter followers 33,116. About Blog Bradley Hansen is a Professor of Economics at the University of Mary Washington. He supplies commentary on economics, history, law amongst other things that interest him. His posts on economic history are particularly fascinating to read. Facebook fans n/a. Twitter followers 168. About Blog Cyril Morong, who teaches economics at San Antonio College, is the Dangerous Economist. Cyril picks up on some very interesting articles in the news with his own comments. This blog is very easy to read and great for people wanting to see how economic principles appear in everyday news. Facebook fans n/a. Twitter followers 259. About Blog Welcome. I am currently teaching Economics at NOHS. This is my 13th year teaching.I enjoy using my business and teaching experience to make the study of economics relevant to my students. Blog by John Gauld. About Blog Brad Cornell teaches financial economics at the California Institute of Technology. About Blog Intelligent Economics is a blog created by me, who is a former business management student, to lecture about economics concepts and theories. The main goal of this blog is to make education easily accesible and freely available even for the people who are non-economists. Seattle About Blog Thoughts on philosophy, politics, economics, and the passing scene influenced by Keynes, Wittgenstein, Rousseau, Rawls, G.L.S. Shackle, and some others. Facebook fans n/a. Twitter followers 9. Washington, DC About Blog Donald Marron, Director of Economic Policy Initiatives at the Urban Institute, shares his thoughts on Economics and finance in his personal blog. It gives us a very clear take on current economic and policy issues. Facebook fans n/a. Twitter followers 4,810. About Blog A blog between the spheres of Economic Theory and Policy Analysis. Blog by Matthew Martin. Facebook fans n/a. Twitter followers 914. New York About Blog Rajiv Sethi is a Professor of Economics at Columbia University. His blogis about economics, finance and statistics. Facebook fans n/a. Twitter followers 1,924. New York City About Blog It is a New York Times column written for wider audiences, authored by Paul Krugman. Paul is an American economist who was awarded the Nobel Economics Prize in 2008 and is known in academia for his work on international economics. He is also a Distinguished Professor of Economics at the Graduate Center of the City University of New York. Facebook fans 12,626,830. Twitter followers 2,224,846. About - The most authoritative Albanian source in English. It covers topics like politics, economy, world news , current events and more. About - Maka Angola is an initiative dedicated to the fight against corruption and the defense of democracy in Angola, founded and directed by the journalist Rafael Marques de Morais. Angola is endowed with immeasurable natural wealth and has recorded impressive economic growth in the last decade, with no positive impact on the daily lives of the majority of Angolans who continue to live in poverty. This is maka!. About - Economic Trends SA is a company specialized in the generation and dissemination of information and economic analysis to think, analyze and interpret the economy and make better decisions. About - Journal of economics, politics and international news. Analysis and specialized columnists. About - No nonsense analysis of the Australian and global economy and the effects on your assets and business. About - John Quiggin’s blog focuses on Australian economics and politics. He delivers an interesting perspective on current events in Australia. He also hosts a weekly ‘sandpit’ forum style discussion. About - This blog began in 2006 and was solely authored by Joshua Gans, an economics professor at the University of Melbourne. In 2008, the blog became multi-authored with other academic economists joining Core Economics. The topics on this blog reflect the wide interests of the authors. Much of the commentary is about economic policy and economic issues. However, a myriad of posts discuss aspects of business strategy, technology and innovation. About - Bill Mitchell is a Professor in Economics and Director of the Centre of Full Employment and Equity (CofFEE), at the University of Newcastle, NSW, Australia. His blog is about Modern Monetary Theory with importance to macroeconomic reality. About - The AEC’s basic goal is the promotion of a free, responsible and prosperous society. To achieve this goal, it considers economic and socio-political questions, prepares studies, and recommends solutions. About - bdnews24.com is a first-of-its-kind venture, being the first Internet-only newsgathering operation in Bangladesh and one of the first in the world. About - Bulgaria Economic Forum is a non-profit legal entity founded in 1998 with the main objectives to promote the business environment of Bulgaria and Southeast Europe to potential foreign investors and to facilitate the dialogue between government and business. About - The informative site about laws & regulation & news by Ministry of Economic & Finance. About - University of Economics and Finance is an higher education organization that provides unique courses of Economics, Finance, and Technology with quality. About - The Progressive Economics Forum aims to promote the development of a progressive economics community in Canada. About - Garth Turner is a Best-selling Canadian author of 14 books on economic trends, real estate, the financial crisis, personal finance strategies, taxation and politics. About - The Worthwhile Canadian Initiative blog is a self proclaimed "mainly Canadian economics blog". Written by a group of intelligent economists, this blog is filled with top quality posts ranging from health, finance and inequality. About - It is the mission of Mises Canada to educate the public on the importance of placing human choice at the center of economic theory, to encourage a revival of critical historical research, and to advance the Misesian tradition of thought through the defense of the market economy, private property, sound money, and peaceful international relations. About - China Economic Review (CER) has been a dependably independent voice on trends and developments in the greater Chinese economy for a quarter century. Our coverage has won recognition from the Society of Publishers in Asia and is widely read by economists, business leaders, academics and students with an interest in one of the world’s most vibrant and complex developing markets. About - Portafolio.co is the most important economic information center in Colombia with a combination of specialized news content, indicators and transactional tools. It is the destination for anyone interested in current economic issues, business, finance, management and personal matters. About - Specialized Portal in Economy News, Financial News, Economic Indicators, Trade and Business in Colombia and El Mundo. About - Copenhagen Economics is the leading economic consultancy in the Nordic region. About - The Economic Research Forum (ERF) is a regional network dedicated to promoting high quality economic research to contribute to sustainable development in the Arab countries, Iran and Turkey. About - Follow the live economic news in the world - The last articles, reports on global economic activity continuously on RFI. About - A blog about economics in the South Caucasus. About - Berenberg Chief Economist Dr Holger Schmieding on the latest economic topics. About - We have a publicly available short version of Eurointelligence Professional Briefing, which focuses on the geopolitical aspects of our news coverage. It appears daily at 2pm CET. About - English website of Heiner Flassbeck, former Vice-Minister of Finance, former head of the macroeconomic unit of UNCTAD, macroeconomist and author. About - The only economic magazine that has been in circulation since 1934 in Greece. About - Aristidis Notis - Economist - Educator. He teaches economic theory - IB economics, he is a writer of manuals on economic theory and management, and editor-in-chief of the XENOFON scientific journal on Economics in Secondary Education. About - A blog on energy, economics and whatnot, from MOL Group‘s economists: Diana Szoke, Peter Simon Vargha and Istvan Zsoldos. Barrel per day - keeps the doctor away. About - The BBJ presents all the essential information on Hungarian business life and many international analyses about the country. About - Qrius is a leading digital magazine that focuses on publishing high-quality articles and opinion pieces on business & economics, policy, politics, culture, foreign affairs and more. About - Browse through Business Blogs, News, Articles, Expert Opinions & more on Economic Times Blog. Find news blogs on markets, stocks, wealth, mutual fund & more. About - Ideas for India is an economics and policy portal that is intended to be source for ideas and evidence on development and growth policy issues in India. About - EPW is also unique because it is the one forum where there is an exchange of ideas across the social science disciplines - political scientists debate with economists, sociologists read what political scientists have to say, historians study what economists have to say and so on. About - To survive in the financial industry especially in banking, which is very competitive today, every industry is required to always innovate. Here's what ... Economic Review-Many Indonesians do not realize the importance of having a safe. About - An Economics Blog by student in economics. About - Indonesia Economic Forum (IEF) brings together business leaders, policy makers, entrepreneurs and thought leaders from Indonesia and the region. About - Iranian Economic Review is indexed in SCOPUS as the largest abstract. and citation database of international peer- reviewed journals. About - Commentary, information, and intelligent discourse about the Irish economy. About - The Progressive Economy is a respected and well-established forum for progressive economists and others commenting on the Irish economy. Most contributors are members of the TASC Economists' Network. About - David recognises the pivotal role of Economics in all of our daily lives and it is his aim to make the ‘dismal science’ as captivating and accessible as possible. David writes a weekly column for The Irish Times, and he also regularly contributes to a variety of other publications including The Financial Times and Woodford Investment Management. About - Economic analysis and commentary on the Irish economy and international financial market developments. About - An Economics Blog by a Professor of Macroeconomics and International Economic Policy at the University of Bologna. About -Dedicated to economic and business news on Lebanon, managed by the team of Lebanon Opportunities. About - We are an independent news source, committed to deliver comprehensive and authoritative coverage of Libyan news and current affairs. About - Economic Development Board of Madagascar (EDBM) is your reference partner for your investments in Madagascar. About - A blog on Monetary and Financial Economics by TIAC. About - The first Radio TV media company from the Republic of Moldova that presents latest information like news, TV news, TV and Radio programs. About - MONACO ECONOMIC BOARD (MEB) is responsible for promoting the Principalities economy and plays an active role in its development. About - Our mission is to promote policy debate and to provide high-quality information resources for the benefit of objective, original economic research and policy analysis in Mongolia. About - The Mongolia Economic Forum (MEF) is an independent, non-governmental, public organization committed to improving and creating common concept to accelerate development of Mongolia by organizing discussions between the business and political leaders, civil society and scholars. About - The Namibia Economist is an important medium for timely identification and evaluation of new market opportunities, management strategies and the main economic news of the week. About - Nepal Economic Forum (NEF) is a not for profit organization aiming to be Nepal’s premier private sector led economic policy and research institution. Established in 2009, NEF seeks to re-define the economic development discourse in Nepal and positively transform Nepal’s economic and development policies. About - Aarthiknews.com is a leading business & economic news portal from Nepal dedicated for building sustainable, developed and prosperous Nepal. About - Welcome to Off the Charts, the official blog of the study association Asset | Economics. About - Do you want to study Regional, Urban, Transport & Environmental Economics in Amsterdam? Check out our Master's Programme at spatial economics! About - The intention of this blog is to highlight economists’ work and provide material to support education and general understanding, especially as it relates to economics in New Zealand. About - Latest breaking business, finance and economic news and views from New Zealand & most popular independent site, interest.co.nz. About - PROSHARE Nigeria, founded in December 2006 as a niche news and analysis service has since grown to become Nigeria's No#1 Financial Information Hub; with key focus on markets, business, personal finance, economy, startups, technology and regulation. About - Pakistan & Gulf Economist is a weekly business magazine published from Karachi covering the business community, stock exchanges, economy of Pakistan & Gulf. About - Latest news and breaking news from Paraguay, Economy. About - SEMANAeconómica, economy and business magazine with the most complete analysis of the Peruvian business world. About - Econs Actually is an established premier tuition programme in Singapore, specializing in 'A' Level Economics Tuition. About - The Spanish Economy provides access to the latest key economic information on Spain in English in a clear and comprehensive manner. About - This blog is written by Tejvan Pettinger. He contributes articles to the Economic Review and writes regularly on economics. About -Our mission is to improve understanding of the fundamental institutions of a free society by analysing and expounding the role of markets in solving economic and social problems. About - This blog discusses economic issues in the news and relates these news items to key economic concepts and theories. Links are given to a range of articles and other relevant material and each blog post finishes with a set of discussion questions. About - EconomicsUK is the personal website of David Smith, the Economics Editor of The Sunday Times, London. His easy to understand writing and clearly defined causes and consequences makes this an accessible blog for beginners. About - Mark Thoma, a Professor of Economics at the University of Oregon, writes about macroeconomics on the Economist’s View. He posts a daily round up of interesting blogs links, while sometimes writing his own detailed analysis in longer posts. About - Focused on economics, investing and financial literacy. One aim is to to help regular readers become more knowledgeable about these important areas to aid their ability to manage their personal finances and to better understand the economy. About - It is a New York Times column written for wider audiences, authored by Paul Krugman. Paul is an American economist who was awarded the Nobel Economics Prize in 2008 and is known in academia for his work on international economics. About - MR began in August of 2003 and there have been new posts daily since that time. In numerous reviews and ratings over the years Marginal Revolution has consistently been ranked as the best or one of the best economic blogs on the web, but it is more (and less) than that, also representing the quirks of its authors. CONGRATULATIONS to every blogger that has made this Top Economics blogs list! 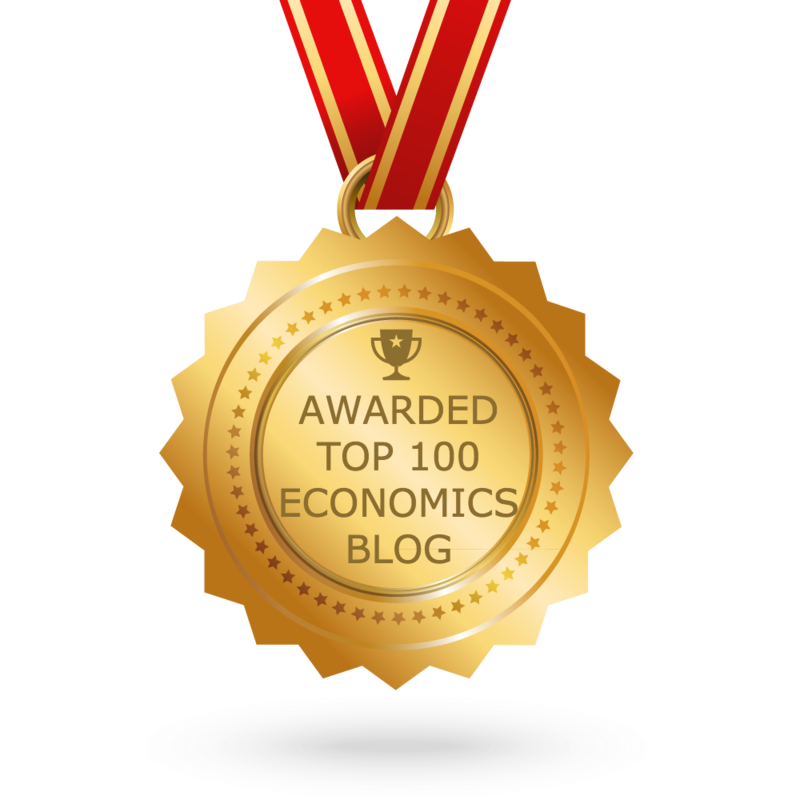 This is the most comprehensive list of best Economics blogs on the internet and I’m honoured to have you as part of this! I personally give you a high-five and want to thank you for your contribution to this world.